With spring just around the corner, now is a great time to start thinking about transitioning your skincare routine for the new season. During the winter months our skin takes something of a beating between thick layers, central heating, harsh temperatures, wind, rain and snow. Not to mention it's usually the time of year we don't drink nearly enough water - I mean, who's going to choose an icey lemon water over a hot chocolate when the weather outside is in minus or single digit numbers?! So as the nights starting getting a little bit longer, and we start to shed off some of those thick layers, now is the time to start prepping your skin ready for spring/summer. During winter months, we're far more likely to eat more stodgy food and less vegetables - so if you've been a little guilty of carb-loading over winter, now is a great time to introduce more fruit and vegetables, and skin friendly foods into your diet. Oily fish is great for the complexion and helping skin looking brighter, and look for food rich in Vitamin A like broccoli, spinach and carrots. Keeping your skin hydrated is important any time of year. But even more so during winter months when the central heating is switched on high and we're swaddled with lots of layers. Lack of hydration will make your skin dry, tight and flakey, and dry skin is more prone to wrinkling because it's less resilient than oily or hydrated skin. Your skin is an organ, and its cells need water to regenerate and function properly. Remember to be drinking lots of water, and we promise that as the sunshine starts to creep into your days, your skin will be looking vibrant and plumped. When spring comes, we tend to get excited and start to strip off winter layers fast, so be prepared for bare legs season by keeping your skin nicely hydrated. It's also a great idea to continue using intensely hydrating moisturisers that use rich ingredients like shea butter, avocado and jojoba oils, on stubborn and dry areas. These will help to lock in extra moisture - try applying a thick coating when you first step out of the bath tub, and let them enrich your skin. For the rest of your skin, now is the time to switch to a slightly lighter formula that won't lie as heavily on you. As we mentioned in our winter sports skincare post, exfoliation is so important this time of year. Not only will a scrub remove dead skin cells and let your product sink in deeper, it also stimulates blood circulation encouraging cell regeneration. For dry skin, try using a more gentle exfoliant to avoid damaging the skin and causing irritation. Using your favourite bath salts combined with a drop of body oil is a great way of creating an easy DIY salt scrub. Try our Soaking Salts and Bath & Body Oils for a luxuriously hydrating scrub. As the seasons click into place, we all naturally find ourselves doing a little Spring cleaning, whether it's sorting out the house, or working through our wardrobes and getting rid of old pieces we don't think we'll wear again. And naturally, it makes sense to do the same with our beauty products. But that's not to say you need to throw away hardly used products or update things just for the sake of it. Carve out a little time on a Sunday afternoon, make yourself a cup of tea, and lay out everything in front of you. Make a pile of things you use every day, a pile of unused things and a pile of used things you didn't like. The latter, put aside to offer friends or family, or consider donating them to a women's shelter locally - often these charities are crying out for cosmetics and beauty products and will happily take used products. Then have a look at your every day and your unused products - once you have them properly organised, it's easier to switch out things, to mix up your routine (and your skin will thank you for this, because when it gets used to certain products, they won't have the same effects). It's also a good way to stop you buying too much - you'll know exactly what you have waiting to use when you run out of something! With more hours of sunshine, now is the time to make sure you've incorporated an SPF into your daily routine. While it's recommended that you wear SPF all year round, when the warmer months come we're far more likely to spending time outdoors enjoying the sunshine - making us more susceptible to sun damage. 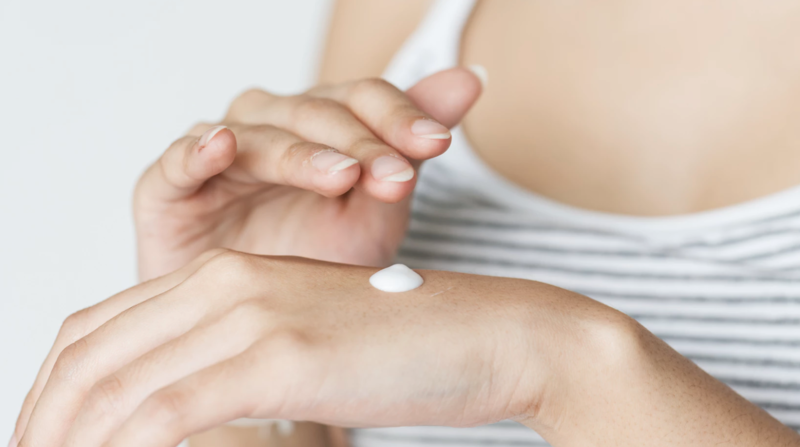 For the best protection for skin, and to prevent breakouts, try to always choose non-chemical sun protection with ingredients like titanium dioxide or zinc oxide.